At first glance, a curious if not bizaarre combination - a very-dated 1949 Ealing Comedy featuring largely male characters, based loosely on a real World War event, but played by an exclusively female cast. 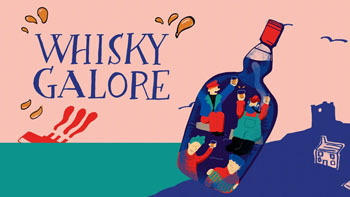 Whisky Galore follows an increasingly popular trend of turning an old 1930’s/40’s British movie into a popular play; notable examples being ‘The Ladykillers’, ‘The 39 Steps’ and ‘Brief Encounter’. This could be viewed as simply nostalgic but perhaps masks an inner desire for a return to a less cynical age which with hindsight can seem more stylish and romantic. Whisky Galore is completely set in the Hebrides, about small, isolated communities and this production succeeds in whisking us away to this period world, in which the military is prominent. The cast of seven play, very convincingly, twenty six different characters giving a broad impression of Scottish island society, not dissimilar in some ways to what Dylan Thomas does for Welsh village life in ‘Under Milkwood’. Given the backdrop, the set was inevitably going to have to be stylised, but the imaginative use of very versatile staging creates a world on the stage which, coupled with a strong and talented cast is very believable. One way in which Whisky Galore differs from most other recent mid-20th Century screen adaptations, is that whilst there is plenty of comedy in the presentation, particularly in the representation of settings, most of the acting is done completely straight with precise observations of the various characters and human interactions. There is considerable attention to detail in the costumes and impressively quick transitions which really give the impression of seeing a wide range of characters. There is far more here than certain multi-role actor plays, where just the swapping of a hat and accent is deemed enough for a change of character and we see full representations of people rather than faint outlines. Whisky Galore is very a slick production, never slacking in pace and holding the audience from start to finish. There are frequent occasions when it is easy to believe you are actually seeing, and hearing, actual men on stage and some macho iterations are very well handled indeed. Other characterisations, such as elderly islanders, are equally entertaining and it would be unfair to try to pick out stand-out performances because this an all-round very accomplished cast. This production is also more than a modern adaptation of a famous film. The all-female cast is itself a tribute to the Osiris Players, an all-female group of actors who toured from 1927-1963, taking theatre to schools and civic halls all over the country, with a wide repertoire which included Shakespeare. In Whisky Galore we have a full length play within a play, with Philip Goulding giving up the Pallas Players. This is not a tribute to an early group of feminists but a salute to a theatre company who above all just wanted to take real theatre into the wider community. Accordingly, the skill of the actors is not so much a demonstration of impressive male impersonations but a show where you forget the actual gender or age of the actor and are just swept along by both the drama and characters of the story. 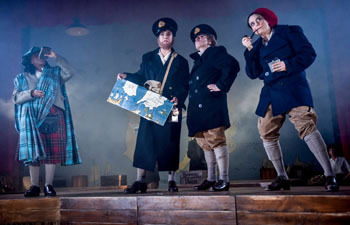 Whisky Galore is an impressive and enjoyable show and a perfect to vehicle to introduce someone who might not be a theatre-goer to just what can be achieved on stage with a few actors and modest staging. Whisky Galore is at Oldham Coliseum until 7th April and tours nationally until 30th June.